High quality line array speaker are professional audio sound equipment, it is widely used in night club, coliseum, plaza for music audio system. Speaker unit using rubidium magnetic materials, such as: we use speaker unit of imports, joint ventures, high-quality, high sensitivity, large sound pressure, light weight magnetic unit of rubidium. LA-8, LA-12 is a whole range of sub-frequency linear series. Efficient use two low-frequency transducer unit, the level of loading HSI sound the clarion call of a horn compression driver. Unique integrated enclosure design, and more speakers installed in a portfolio box, forming a power amplification of the sound system, so that the interaction between the speakers to minimize interference with far projection, high sensitivity, and the penetration of strong, regional voice coverage more uniform characteristics. LA-10 is a 3 separ frequency range linear series, the unique integrated design, a number of speakers will be installed in a combination unit box, forming a power great sound system. Compact reasonable array dedicated hanger, vertical array of speakers groups, so that the interaction between the speakers to minimize interference with far projection, high sensitivity, and the penetration of strong, regional voice coverage more uniform characteristics. LA-15 is a 3 separ frequency range line array series. Loudspeaker system used two 15-inch (LBA15-100) efficient low-frequency transducer unit, 75 × 30 degrees to the clarion call for the contents of the HSI four 8 inch (MBA8-75 ) IF efficient transducer unit and two 3 inch (HY76) tweeter, unique integrated design, a number of speakers will be installed in a combination unit box, forming a power great sound system. Compact suspended for a reasonable array planes, in the vertical array of speakers groups, the speakers between the comb disruption to the weakest, with far projection, high sensitivity, and the penetration of strong, regional voice coverage more uniform characteristics. 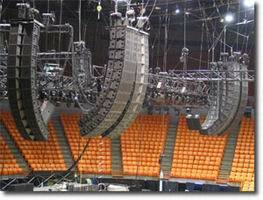 LA-6 Series is a line of the whole range of small-frequency line array system. Efficient use two low-frequency transducer unit, the contents blaring an efficient compression unit. Other a grid of integrated enclosure design by many UMQC-6 UMQC-12B and the installation of a combination of a high-sound system, the interaction between the speakers to minimize interference with far projection, high sensitivity, and the penetration of strong, regional voice sound more uniform the characteristics of the compact endless hanging pieces. to install more convenient. LA-6 with LA-12B seperation frequency point are 280 Hz. LA-8 with LA-55B seperation frequency point are 200 Hz. LA-12 with LA-55B and LA-88B seperation frequency point are 200Hz and 100Hz. LA-15 with LA-88B seperation frequency point are 90Hz.